Press Release: "Scottish Salmon Farming 101 - Scottish Parliament inquiry opens 'in early 2018'"
Data published by the Scottish Government reveals that Marine Harvest killed over a quarter of the seals shot in Scotland in 2016. 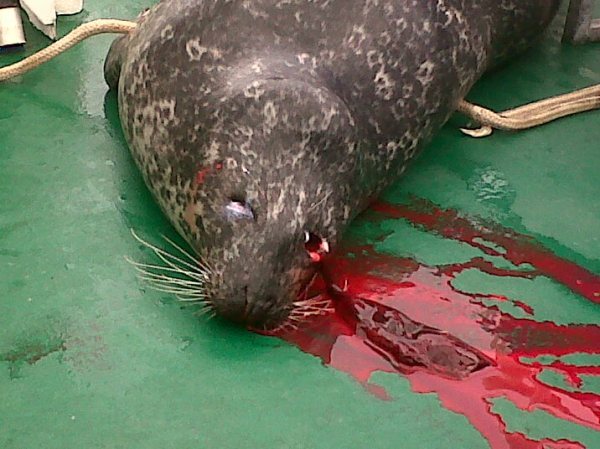 Since 2011 (from when official figures are publicly available), Marine Harvest has killed 102 seals shooting up from 5 seals killed in 2013 to 26 seals killed in 2016. Marine Harvest - the world's largest salmon farming company - supplies Sainsbury's as well as Waitrose. Ben Hadfield, Managing Director of Marine Harvest Scotland, told today's Sunday Times: “If seals keep attacking the fish, then, like a farmer kills foxes, we shoot them.” Read more via: "Seals shot to save Waitrose salmon". Documents disclosed by the Scottish Environment Protection Agency (SEPA) via Freedom of Information (FOI) expose yet more damning details of how the Scottish Government intervened at the behest of the salmon farming industry to stave off a ban on the use of the toxic chemical Slice (Emamectin benzoate). Read more via Sunday Herald: "Scottish government accused of intervening to block ban on toxic pesticide"
New research - "Large-scale underwater noise pollution from Acoustic Deterrent Devices (ADDs) on the west coast of Scotland" - presented earlier this week at the European Cetacean Society conference in Denmark sounds the alarm on the use of ADDs on Scottish salmon farms. The Global Alliance Against Industrial Aquaculture is now calling for an immediate ban on the use of ADDs on salmon farms to protect cetaceans, especially harbour porpoises on the West coast of Scotland. Read more via today's Sunday Herald: "Health of whales, dolphins and porpoises put at risk by underwater alarms"
Today (7 May), GAAIA filed a formal complaint with the European Commission against the UK and Scottish Government for the "deliberate & reckless disturbance" of cetaceans (European Protected Species) including breach of The Conservation (Natural Habitats, &c.) Regulations 1994 (as amended in Scotland) and breach of the Inner Hebrides and the Minches candidate Special Area of Conservation (cSAC) for harbour porpoise submitted to the European Commission in 2016. Exclusive data obtained via Freedom of Information reveals that 90% of 'Scottish' salmon is now imported as eggs from overseas with Norway accounting for 86% of egg imports. Campaigners are now calling on the Scottish Government to curb egg imports to protect the genetic integrity and sanitary status of 'Scottish' salmon. Read more in today's Sunday Times: "‘Tartan imposters’ charge as fish egg imports hit 90%"
Press Release: "Toxic Toilets: Salmon Farms Pollute Scotland's Lochs"
Press Release: "Failing Fish Farms - 18% rated "poor" by SEPA in 2015"
Financial Times: "Lousy threat to Scotland’s fish farms"
The Sunday Times: "Record chemical use ‘of concern’ to salmon giant"
Exclusive documents obtained from the Scottish Environment Protection Agency (SEPA) reveal secret plans to expand Scotland's salmon farming industry - including proposals for super-sized salmon farms producing up to 8,000 tonnes of farmed salmon. Today's Sunday Herald reports: "Outrage over secret plans to base world's biggest salmon farm in Scotland". Leader Comment: "A poodle cannot be a watchdog"
The Sunday Herald: "Outrage over secret plans to base world's biggest salmon farm in Scotland"
A new 'Enforcement Regime' policing lice-ridden Scottish salmon farms is to be introduced from 1 April 2017 - despite "grumbles" from the salmon farming industry. Documents obtained via FOI from the Scottish Government reveal that sea lice damage is costing Scottish salmon farming an estimated £300 million per year . Whilst other countries publish site specific sea lice data, Scotland is "out of kilter" concedes a briefing to the Cabinet Secretary. "The aquaculture industry have strong concerns relating to commercial confidentiality and operational sensitivities," stated another briefing. The salmon farming industry "remain resistant to increased legislative controls citing lack of evidence of impacts and significant commercial risks associated with offences or Enforcement Notices," admitted another briefing. Despite escalating sea lice, infectious disease and chemical resistance problems, the Scottish Environment Protection Agency (SEPA) is gearing up to remove biomass limits on salmon farming production across Scotland. "Lifting the limits is sheer lunacy," said Don Staniford of the Global Alliance Against Industrial Aquaculture. "The salmon farming industry is already dealing with escalating sea lice infestation, chemical resistance and disease problems. Removing what few controls there are in favour of unrestricted expansion is a recipe for ruin. Salmon farms, even at current capacity, are causing widespread benthic impacts with dead zones under cages. Increasing production will effectively wipe out whole swathes of the sea-bed. This is Scotland's very own 'Silent Spring of the Sea'." Read more in The Sunday Herald: "Plans to scrap fish farm limits slammed"
Read more via The Sunday Times (1 January 2017): "Salmon industry toxins soar by 1000 per cent"
Information obtained from the Scottish Government via FOI reveals that 95,400 farmed salmon were killed during July and August this year by a 'Thermolicer' at Marine Harvest's salmon farm in Loch Greshornish on the Isle of Skye. A briefing note to the Cabinet Secretary for Rural Economy and Connectivity in September reported that the mass mortalities (460 tonnes) cost Marine Harvest £2.7 million and "highlights the ongoing difficulties and costs faced by industry with regards to sea lice management". In an embarrassing twist the Thermolicer was described as "a recent £4 million investment by Scottish Sea Farms rented by Marine Harvest" . Read an Exclusive by Rob Edwards in today's Sunday Herald newspaper: "Oops: fish farm firm kills 175,000 of its salmon by accident"
- 77,884 dead salmon (11 mortality) at Invasion Bay (Loch Sunart) due to "maturation"
New U.S. rules protecting marine mammals could cost trigger-happy salmon farmers around the world a staggering $2 billion in lost export markets for farmed salmon! In emails to the Global Alliance Against Industrial Aquaculture, the U.S. Government has confirmed that salmon farms in Maine and Washington do NOT kill marine mammals - in stark contrast to lethal salmon farms in Scotland, Canada, Chile, Faroe Islands, New Zealand and Australia (with question marks hanging over Norway and Ireland). In order to comply with U.S. standards (i.e. zero marine mammals killed), farmed salmon sourced from salmon farms which kills seals, sea lions, dolphins and even whales will be banned from the lucrative U.S. market by 1 January 2022 (when the Fish and Fish Product Import Provisions of the Marine Mammal Protection Act is enforced). Campaigners are calling on the Duke and Duchess of Cambridge to endorse wild salmon not farmed salmon during the royal visit to Canada later this month. The royal party will be presented with a gift of wild salmon when they arrive in Victoria (24 September) and challenged to issue a public statement pledging to boycott farmed salmon. "Shamefully, both William and Kate have been cheerleaders for the disease-ridden salmon farming industry in Scotland," said Don Staniford, Director of the Global Alliance Against Industrial Aquaculture (GAAIA). "Serving guests at their royal wedding diseased farmed salmon was a slap in the face for healthy wild fish and still leaves a nasty taste in the mouth. Farmed salmon is not fit for the Queen’s corgis let alone young children like Princess Charlotte and Prince George. Wild salmon is clearly the King of Fish not the farmed imposter with the fake tan, lice-infested skin, parasitic mushy flesh and cancer-causing chemical contamination." Despite sceptical media reports, a new U.S. rule published last month explicitly states that salmon farms must stop killing seals in order to export to the lucrative U.S. market . Scottish salmon - the UK's #1 food export - now risks being banned from the £200 million per year U.S. market over Scotland's ongoing seal slaughter which exceeds 1,500 dead seals since 2011. Importing countries will have a five-year interim exemption period (starting on 1 January 2017) to implement a regulatory program that "prohibits the intentional killing or serious injury of marine mammals in all fisheries". Read more in today's Sunday Herald: "End the slaughter of seals in Scotland now"
To comply with new U.S. standards to be implemented on 1 January 2017, importing countries must implement a regulatory program that "prohibits the intentional killing or serious injury of marine mammals in all fisheries" stated the import provisions issued last month. Read more via "NOAA establishes international marine mammal bycatch criteria for U.S. imports" and "Seafood Import Provisions under the Marine Mammal Protection Act"
"The new U.S. rules are a body blow for Scottish salmon which is shamefully drenched in the blood of dead seals," said Don Staniford, Director of the Global Alliance Against Industrial Aquaculture. "If Scottish salmon farmers do not stop killing seals then this ruling could cost the industry over £200 million per year and leave a gaping hole in the UK's number one food export." Since official Government figures were disclosed in 2011, over 750 seals have been killed at Scottish salmon farms (read more via "Mapped: every Scottish salmon farm that shot seals") with over 800 killed by river fisheries and netting stations. 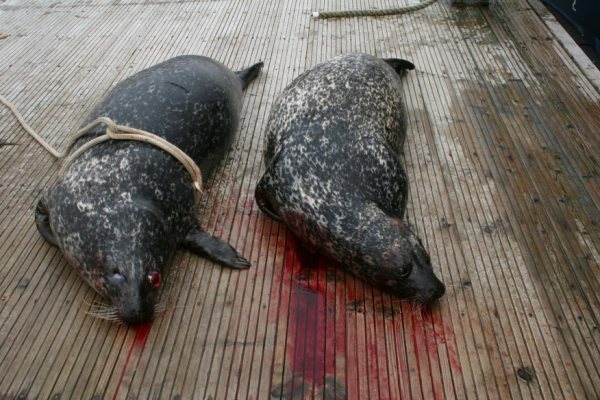 241 seals were killed by salmon farms in 2011 with 208 dead seals in 2012, 105 dead seals in 2013, 80 in 2014 and 95 in 2015. Of the 24 seals reported killed thus far in 2016 (only Q1 data is available online) all but one were killed by salmon farms. The U.S. is the largest export market for Scottish farmed salmon accounting for 30,000 tonnes in 2015 at a value of £215 million in 2014. With 186,508 tonnes of Scottish farmed forecast to be produced in 2015 that means one in six or 16% of Scottish farmed salmon is exported to the U.S. Farmed salmon is the largest food export from Scotland, accounting for around 40% of total value and in 2014 it also topped the list of UK food exports. During the first quarter of 2016, official Government figures show that salmon farmers have already killed 23 seals including 10 by Scottish Sea Farms (Bight of Bellister, Vidlin North, Slocka Ronas Voe, Shapinsay, Kishorn West and Loch Spelve), six by Marine Harvest (Eilean Grianain, Isle Ewe, Torridon, Greshornish, Maol Ban) and four by Loch Duart in the Sound of Harris. An analysis of the data in October 2015 revealed that Scottish Sea Farms (who exclusively supply Marks & Spencer) were Scotland's worst serial killers with 150 dead seals followed by Grieg Seafood Hjaltland (136 seals killed), the Scottish Salmon Company (128 seals killed) and Marine Harvest (76 seals killed). "Instead of shooting themselves in the wallet, Scottish salmon farmers should hang up their guns and stop killing seals," continued Staniford. "Risking over £200 million in exports in order to kill less than one hundred seals is a sure fire way of going broke. Shoppers should steer clear of ethically bankrupt Scottish salmon. Scottish salmon, you're fired!" "Since each seal killed by salmon farmers in Scotland currently costs the UK economy approximately £2.5 million, surely it would be cheaper to bite the bullet and install predator nets at a cost of £40,000 per cage?" concluded Staniford. "Even if that means £1 million per farm and a capital outlay of nearly £150 million - the latest Scottish Government fish farm survey details 143 salmon farms in production - it would be worth the long term investment. Scotland's seals certainly think it is time to stop shooting and start investing in predator nets." The threat of a U.S. on Scottish salmon comes in the wake of the publication of a new paper in Frontiers of Marine Science. "The current legislation does not specify closed seasons to protect breeding seals and 35% of necropsied seals were pregnant gray seals," stated the paper from the University of Edinburgh and University of Bristol. "Seals have also been shot during their lactation periods when pups are dependent on their mothers. This raises significant welfare concerns". "The majority of the seal management cases necropsied at Scotland's Rural College (SRUC) Wildlife Unit were found to have been shot effectively with a single shot destroying the cranial vault (SRUC Wildlife Unit, 2012; Brownlow and Davison, 2013, 2014)," continued the paper. "However, each seal management case study report highlights at least one case of concern. In 2012 two seals (out of the 21 examined) showed signs of multiple gunshot wounds and blood aspiration which suggested that they had not been killed by the first shot (SRUC Wildlife Unit, 2012). In 2013, one seal (out of the seven examined) had been shot in the neck and, in 2014, one (out of the six examined) had been shot through the mandible (Brownlow and Davison, 2013, 2014)." More news via "End the slaughter of seals in Scotland now" and "Charity makes plea to end seal shooting in Scotland"
An analysis by GAAIA in November 2015 also found that a tiny proportion of seal corpses were reported let alone recovered or collected. In fact, of the 51 seals killed in the first two quarters of 2015 (January to July) zero carcasses were recovered or collected and only three were reported to the Scottish Marine Animal Strandings Scheme. Out of 173 seals killed during 2013 and 2014 a total of 19 carcasses (11%) were reported, 16 carcasses recovered (9%) and only one carcass (<1%) collected (read more via "Appendix: Companies, Regions & Sites"). Scotland is not the only country under fire for the deliberate killing of marine mammals. Chile, Canada, New Zealand and Australia have been subject to criticism for the killing of sea lions, seals, dolphins and even whales. In Australia, seals have been killed on salmon farms in Tasmania (read more via "Tasmania's salmon trade casts deadly net"). Environment Tasmania report that: "As of June 2013, at least 144 protected seals have died as a result of fish farming in just four years". The Tasmanian Times reported in July 2015: "the Tasmanian Government seal management strategy has resulted in normally protected seals being deliberately killed with Government approval". In Chile, a photo of salmon farmers killing a sea lion attracted the condemnation of both the Chilean Government and salmon farming industry itself in July 2015. Sernapesca filed a formal complaint for animal abuse following the identification of the salmon farming company responsible (read more via "Sernapesca files formal complaint over salmon farm workers’ animal abuse"). In New Zealand, at least four dolphins and four seals have been killed in salmon farms in the Marlborough Sounds since 2011 (read more via "Dolphins die on NZ King Salmon farms"). In Canada, data on mortalities at salmon farms in British Columbia is routinely published online by the Government. For example, the data published for Q4 2015 (October-December) reveals the deliberate killing of 15 California sea lions by Cermaq in Clayoquot UNESCO Biosphere Reserve. In 2013, a humpback whale was also found dead in a salmon farm in Clayoquot Sound. In 2014 there was also a humpback whale killed by a salmon farm off the Isle of Mull in Scotland. The iconic Atlantic salmon is facing imminent extinction on the West coast of Scotland due to the lethal impacts of escapes, diseases and parasites from salmon farms. Salmon farming is quite literally killing wild fish - that's the stark message from yesterday's Mail On Sunday newspaper. "Media Backgrounder: Scottish Salmon's Serial Seal Killers"
"Appendix: Companies, Regions & Sites"
"Appendix: Source Data - Seal Killing Return Forms Submitted by Salmon Farms"
GAAIA has scored a notable victory with two decisions published today by the Scottish Information Commissioner (SIC). In both cases, the SIC has ordered Scottish Ministers to disclose damning seal-killing data in relation to salmon farms by 21 August 2015 (the SIC is required, by law, to give the Ministers at least six weeks to disclose the information). Read in full via "VICTORY: Disclosure of Seal-Killing Salmon Farm Data Ordered by 21 August"
"Today's decisions are landmark rulings," said Don Staniford, Director of the Global Alliance Against Industrial Aquaculture. "If the Scottish Government is forced yet again to disclose the names of the trigger-happy salmon farms killing seals then the public will be able to boycott seal-unfriendly Scottish salmon. If the Scottish Information Commissioner rules in favour of non-disclosure then it will send the shameful signal that Scottish salmon farmers can get away with murder. Either way, consumers eating lethal Scottish salmon have blood on their hands. Better be seal-safe than sorry and boycott all Scottish salmon - even RSPCA 'Freedom Food' and ASC-certified farmed salmon which shockingly sanction the slaughter of seals." The decisions follow repeated Freedom of Information (FOI) requests by the Global Alliance Against Industrial Aquaculture (GAAIA) since April 2012 asking the Scottish Government to name individual salmon farms killing seals. Despite rulings by the Scottish Information Commissioner in 2012 and 2013 forcing disclosure, the Scottish Government stopped publishing site specific quarterly data in 2014 claiming in August 2014 a "significant risk of accidental injury to campaigners if they seek to get between licenced seal shooters and seals". Read more details via GAAIA's 'Media Backgrounder: Sealed Scottish Salmon'. A new 'Sustainability Report' launched today by the Global Salmon Initiative is not worth the paper it is written on claims the Global Alliance Against Industrial Aquaculture (GAAIA). "The whole concept of 'sustainable salmon farming' is an oxymoron," continued Staniford. "The farming of carnivores such as salmon is, by definition, inherently unsustainable. The global salmon farming industry is draining our oceans of wild fish as a feed supply to fuel its insatiable appetite - it takes anywhere between 3 to 9 tonnes of wild fish to produce one tonne of farmed salmon! Consequently, the words 'salmon farming' and 'sustainable' don't even belong in the same sentence let alone a whole report devoted to sustainable salmon." "Put lipstick on a pig and it's still a pig," concluded Staniford. "By discharging untreated sewage effluent directly into our global ocean, salmon farms are the piggeries of the sea. Not to mention the fact that from 1 June 2013, farmed salmon was permitted by the EU to be fed on chicken and pig products. 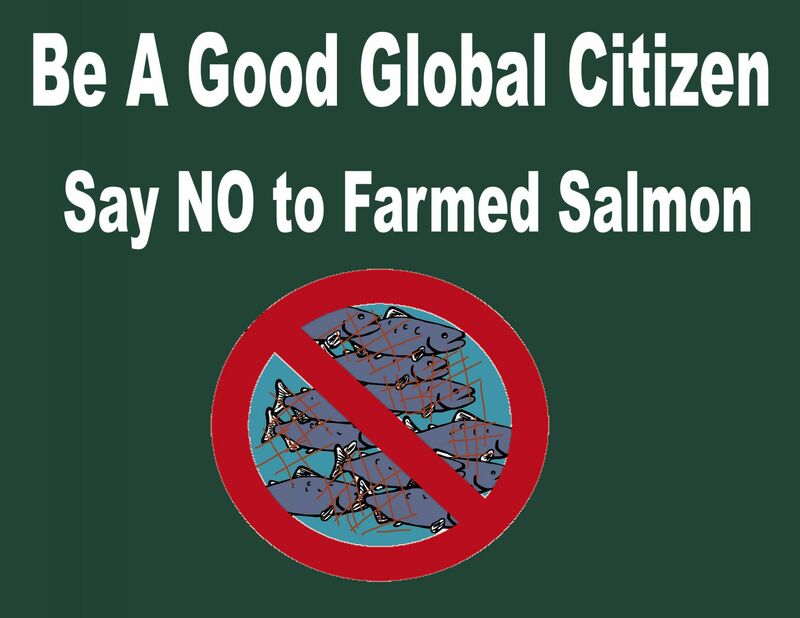 Stop pigging out on farmed salmon - join the global consumer boycott now!" Here's a press release issued by the Global Alliance Against Industrial Aquaculture (7 September) - read in full with a media backgrounder via "The Great International Salmon Swap"
A farmed salmon processing plant operated by Wester Ross Fisheries is named and shamed as a source of a decade of environmental pollution, illegal discharges and 'seriously non-complaint' operations. FOI requests were prompted by a whistleblower and former employee at Wester Ross Fisheries who testified to sea lice infestations at the farmed salmon processing plant in Dingwall, Ross-shire. A comparison with farmed salmon production data published annually by the Scottish Government reveals that there has been one escapee per 0.7 tonnes of farmed salmon production since 1998 - with 2011, 2005 and 2000 the worst years for escapes. In 2005, there were ten escapees per tonne of farmed salmon production. A comparison with wild salmon catch statistics published annually by the Scottish Government reveals that farmed salmon escapees are twice the number of wild salmon caught. Between 2002 and 2012 a total of 1.2 million wild salmon were caught with an average of 107,347 per year. This compares with a total of 2.4 million farmed salmon escapees with an average of 217,365 per year for the same period (2002-2012). The worst offender was Norwegian-owned Marine Harvest who is responsible for over a quarter of escape incidents since 2002. Other repeat offenders are Scottish Sea Farms, Balta Island Seafare, Loch Duart and the Scottish Salmon Company. In 2006, the Scottish Information Commissioner made a landmark ruling following a complaint by the Salmon Farm Protest Group forcing the Scottish Government to disclose the names of companies responsible for escapes. In January 2014, 154,569 farmed salmon escaped from a Meridian salmon farm in Shetland currently owned by Marine Harvest (read more news via BBC News, STV News, Shetland News, The Herald, Intrafish, Fish Farmer, Fisheries Information Service, Undercurrent News, The Press & Journal, The Shetland Times and Fish Farming Xpert). Read exclusively in The Daily Mail (8 March): "DDT found in salmon: Pesticide discovered in farmed fish on sale in five major British supermarkets"
Read more via today's Press & Journal: "Call for ban on salmon to China"
Ullapool, Scotland - The smoking hot 'Salmon Farming Kills' campaign has been re-launched by Don Staniford in his new role as Director of the Global Alliance Against Industrial Aquaculture (GAAIA). Don Staniford was previously the Global Co-ordinator of GAAIA and this week stepped down as Director of Protect Wild Scotland to work full-time on the 'Salmon Farming Kills' campaign. Don Staniford will be visiting Norway in June (13-18) and Canada in September/October as part of the 'Censored Salmon' tour. "GAAIA will be delivering the 'Salmon Farming Kills' message to all corners of the globe," said Don Staniford, Director of GAAIA. "The Norwegian State, as owners of Mainstream/Cermaq, may be able to silence free speech in corporate Canada but they cannot censor global criticism about the salmon farming industry's polluting practices. Norway may have a monopoly on salmon farming but Norway does not own the truth. The ugly truth is that salmon farming spreads toxic wastes, infectious diseases, sea lice parasites, social problems and contaminated food around the world. Far from being labelled as 'healthy and nutritious', farmed salmon should carry an environmental and public health warning." The 'Salmon Farming Kills' web-site was taken off-line in August 2013 pending the Supreme Court of Canada's final decision in the lawsuit filed in March 2011 by Mainstream Canada (EWOS Canada) Vs. Don Staniford and the GAAIA. Earlier this month (13 February), the Supreme Court of Canada dismissed GAAIA's application for leave of appeal leaving Don Staniford and the GAAIA facing a legal bill estimated at $500,000 and a permanent injunction banning over fifty statements such as 'Friends Don't Let Friends Eat Farmed Salmon', 'Wild Salmon Don't Do Drugs' and 'Salmon Farming Spreads Disease'. "Whilst Canada and Norway are shamefully censoring criticism of the salmon farming industry, thankfully the European Parliament and European Union are happy to hear about the environmental and public health impacts of salmon farming," continued Staniford who earlier this month addressed a meeting of the European Economic & Social Committee. "Consumers around the world need to wake up the fact that salmon farming is producing a hazardous product detrimental to environmental and public health. Farmed salmon is cheap and nasty and should be avoided like the plague. Better be safe than salmon farming - boycott farmed salmon!" Don Staniford is an award-winning campaigner and author. He has campaigned against the global threat of salmon farming since 1998 and has worked for Friends of the Earth Scotland, the Salmon Farm Protest Group, Friends of Clayoquot Sound, the Pure Salmon Campaign, Salmon Are Sacred, Wild Salmon First, Superheroes 4 Salmon, the Green Warriors of Norway, Protect Wild Scotland and the Global Alliance Against Industrial Aquaculture. In 2002, he was awarded the Andrew Lees Memorial Award at the British Environment & Media Awards. “They commended him as a pre-eminent campaigner on the ecological, economic, consumer and safety issues associated with the fish farming industry, particularly in Scotland,” reported WWF. In 2005, he won the Roderick Haig-Brown BC Book Prize for “A Stain Upon the Sea: West Coast Salmon Farming” (co-authored with Alexandra Morton, Stephen Hume, Otto Langer, Betty Keller and Rosella Leslie). Norway's state broadcaster NRK recently described him as a "hair in the soup of the global salmon farming industry" and in 2012 Intrafish dubbed him the salmon farming industry's "No. 1 enemy". EcoAmericas described him as “a man on a mission against sea-cage salmon farming” whilst the New Zealand Herald referred to him as “the fish farm bogeyman”. Don Staniford is the author of "The One That Got Away: Marine Fish Farming in Scotland" (Friends of the Earth Scotland, 2001); "Sea Cage Fish Farming: an evaluation of environmental and public health impacts " (European Parliament, 2002); "Cage Rage" (The Ecologist, 2002), "A Big Fish In a Small Pond" (Terram, 2002); "Closing the Net on Sea Cage Fish Farming" (Queensland Conservation Council, 2003); "Silent Spring of the Sea" (Harbour Publishing, 2004); "Fish Farmageddon: The Infectious Salmon Aquacalypse" (GAAIA, 2011); "Five Fundamental Flaws of Sea Cage Fish Farming" (European Economic & Social Committee, 2014) and the forthcoming report "Smoke on the Water, Cancer on the Coast" (GAAIA, 2015). HRH The Prince of Wales, the Duke of Westminster and Duke of Northumberland were today (15 January) challenged to stand up for wild fish in their roles as patron and presidents of the Salmon & Trout Association and Atlantic Salmon Trust. Following an exposé in The Sunday Times (“Anti-aquaculture body ‘aiding fish farm growth’”), a letter urging withdrawal from the ‘Managing Interactions Aquaculture Project’ (MIAP) has been sent from river owners and wild salmon advocates. The letter asks groups including the Rivers & Trusts of Scotland (RAFTS), Fish Legal and the Association of Salmon Fishery Boards to “stop supporting the promotion of salmon farming on West coast Scottish sea lochs and start protecting wild salmon and sea trout”. The Rivers & Trusts of Scotland together with the Association of Salmon Fishery Boards, Fish Legal, the Angling Trust, the Salmon & Trout Association (whose patron is HRH The Prince of Wales and whose president is the Duke of Northumberland) and the Atlantic Salmon Trust (whose patron is HRH The Prince of Wales and whose president is the Duke of Westminster) have all publicly pledged endorsement of salmon farming on the West coast of Scotland via their support for the Scottish government-funded MIAP (read a ‘Ministerial Briefing’ and ‘Policy Paper: Aquaculture’). The withdrawal of WRASFB now leaves only 8 groups as ‘projects partners’ supporting MIAP although the RAFTS web-site still lists 10 groups including the Outer Hebrides Fisheries Trust, West Sutherland Fisheries Trust and Wester Ross Fisheries Trust (groups funded by salmon farming companies such as Marine Harvest, the Scottish Salmon Company and Loch Duart – and with representatives of salmon farming companies on the board). The Office of the Scottish Charity Regulator is now investigating complaints against Wester Ross Fisheries Trust and the Rivers & Fisheries Trusts Scotland in relation to conflicts of interest with salmon farming companies (read more via The Sunday Herald’s: “Wild fish groups under investigation by charity watchdog”). Fit for the Queen & Residents of Nova Scotia - Loch Duart’s Chlamydia-Contaminated Salmon? North Uist, Outer Hebrides – A warning letter from the Association for the Preservation of the Eastern Shore in Nova Scotia will be delivered later today (19 November) to Loch Duart’s office in Lochmaddy. Disease data obtained from Marine Scotland via Freedom of Information reveals that Loch Duart’s operations in Lochmaddy were riddled with infectious diseases including Epitheliocystis (Chlamydia), Salmonid Alphavirus (Salmon Pancreas Disease Virus) and Vibrio species (Winter Ulcer). GAAIA has now written to Her Majesty the Queen, who served Loch Duart farmed salmon at her Diamond Jubilee, asking her to screen her farmed salmon for Chlamydia and other infectious diseases. In July 2012, following a FOI request, Marine Scotland also revealed that escapees from Loch Duart’s operations in Lochmaddy in December 2011 had “some Amoebic Gill Disease” (Read more via "Gill Diseases: Scottish Salmon's Dirty Big Secret"). Hebrides Against Salmon Farms Launched on Lewis! Isle of Lewis, Outer Hebrides – A new campaign group uniting forces against salmon farming expansion on the West coast of Scotland is launched today (13 November) at a public meeting in Back near Stornoway on the Isle of Lewis. ‘Hebrides Against Salmon Farms’ brings together local communities who are fighting salmon farms across the Western Isles. International campaigners including Kurt Oddekalv of the Green Warriors of Norway, Elena Edwards of Wild Salmon First from Canada and Don Staniford of the Global Alliance Against Industrial Aquaculture are in the Outer Hebrides visiting salmon farms in Loch Roag and around Harris. GAAIA and Wild Salmon First have been touring around Scotland all November and will be joining Save Our Seals Fund in Edinburgh on 21 November for a protest against the killing of seals by salmon farms. On 22 November, the tour moves to Ireland for a public meeting in Bantry Bay (23 November) and then a visit to Galway Bay where the Irish Government are proposing a 15,000 tonne “organic” salmon farm (for a full itinerary please visit online here). Isle of Mull, Scotland – A dossier of data obtained via Freedom of Information reveals that Scottish salmon farming is being ravaged by infectious diseases led by the parasitic killers Amoebic Gill Disease, Proliferative Gill Inflammation and Chlamydia: "Gill Diseases: Scottish Salmon's Dirty Big Secret". Now a former public relations director of the salmon farming company first affected by gill diseases has blown the whistle stating that she was “not prepared to lie to journalists about the extent of the mortalities” . The Scottish salmon farming industry – which is over 65% owned by Norwegian companies and Norwegian banks - is now paying a hefty price. The Scottish Salmon Company, Marine Harvest and Scottish Sea Farms are suffering mass mortalities of up to 70%. Marine Harvest and the Scottish Salmon Company – both listed on the Oslo Stock Exchange – reported significant losses to shareholders and investors in their financial reports. Marine Harvest, Scotland’s and the world’s largest salmon farming company, predicted further losses in Q4 2012 as gill diseases eat into profits . Official data from the Scottish Government reveals that Amoebic Gill Disease was first reported at Lamlash Bay in October 2011 killing 279,000 farmed salmon. By April 2012 the deadly disease had spread to 15 sites including Loch Roag in the Western Isles, the Firth of Lorne, Seil Sound, the Sound of Mull, Loch Kishorn, the Isle of Gigha and the Orkney Isles . GAAIA has now filed a FOI with Marine Scotland requesting disease data from April to November 2012. Read more via "Gill Diseases: Scottish Salmon's Dirty Big Secret"
Don Staniford of the Global Alliance Against Industrial Aquaculture testifies today (4pm New Zealand Standard Time) to the New Zealand King Salmon Board of Inquiry via a conference call from Europe (read today’s hearing schedule online here). King Salmon (owned by Malaysia’s Tiong family and private equity firm Direct Capital) is seeking to build nine new salmon farms in the Marlborough Sounds. On Saturday (29 September), Guardians of the Sounds is organizing a flotilla protest against King Salmon’s expansion plans. GAAIA submitted a formal objection in April 2012 – along with 800 other stakeholders including Guardians of the Sounds and Marlborough District Council. Don Staniford, an award-winning campaigner and author, visited King Salmon’s operations in the Marlborough Sounds back in 2003 and was alarmed even then at the scale of their operations (read more online here and here). The New Zealand Herald dubbed Mr. Staniford “the fish farm bogeyman”. Nanaimo, B.C. – Wild Salmon Warriors at High Noon today will stage a citizen’s arrest of Government officials outside DFO’s Pacific Biological Station for non-disclosure of ISA. The charges relate to a recently leaked 2004 report co-authored by DFO’s Dr. Simon Jones and Dr. Garth Traxler detailing over 100 positive tests for ISA in farmed Atlantic salmon and wild Pacific salmon. Other protests are taking place today outside DFO offices in Tofino and Lillooet – and tomorrow in Victoria – as part of an ‘Action Week for Wild Salmon’. “Someone should be going to jail over this,” said John Werring of the David Suzuki Foundation on reading the secret DFO report (as quoted in the LA Times). “Never in my over 20 years of doing my work have I seen such duplicity by our government” (more details via ‘Fishyleaks’). In April, protestors cordoned off DFO’s offices in Vancouver as a ‘Crime Scene’ and performed a mock citizen’s arrest of Canadian Fisheries Minister Gail Shea (watch video online here and here). This letter was sent BEFORE the damning revelations in November via ‘Fishyleaks’ – and before the Cohen Commission’s ISA hearings taking place in Vancouver on December 15, 16 & 19. DFO officials testifying to the Cohen Commission include Dr. Simon Jones, Mrs. Nellie Gagné, Dr. Kristi Miller, Dr. Peter Wright and Mr. Stephen Stephen. Sointula, British Columbia – A second case of the deadly disease Infectious Salmon Anaemia (ISA) was reported last week in coho salmon from Weaver Creek in the Fraser River watershed. The positive test was reported by the World Organization for Animal Health’s (OIE) Reference Laboratory to the Canadian Food Inspection Agency on October 20. Last week, lawyers representing the Canadian Government submitted details to the Cohen Commission – read the ‘Internal’ documents online here. “There will be hell to pay for allowing ISA into British Columbia,” said Don Staniford of the Global Alliance Against Industrial Aquaculture (GAAIA). “It’s a living nightmare that such a deadly disease has spread to coho salmon in the Fraser River following the positive tests in sockeye salmon on the Central Coast over 500 km away. The nightmare news is enough to make you scream blue murder. GAAIA alleges that the Canadian Government - as represented by various agencies including the Department of Fisheries and Oceans (DFO) and the Canadian Food Inspection Agency (CFIA) - are guilty of incompetence, silence and arrogance as well as negligence. In terms of the latter, GAAIA has consulted with a lawyer with a view to a private prosecution or lawsuit related to mischief, breach of public trust and/or malfeasance. GAAIA today wrote to the Minister of Fisheries (Keith Ashfield), the Minister of Agriculture (Gerry Ritz) and BC Minister of Agriculture (Don McRae) – download letter online here. Vancouver, British Columbia - The newly-formed Global Alliance Against Industrial Aquaculture(GAAIA) this week launched a smoking hot international campaign against Big Aquaculture. 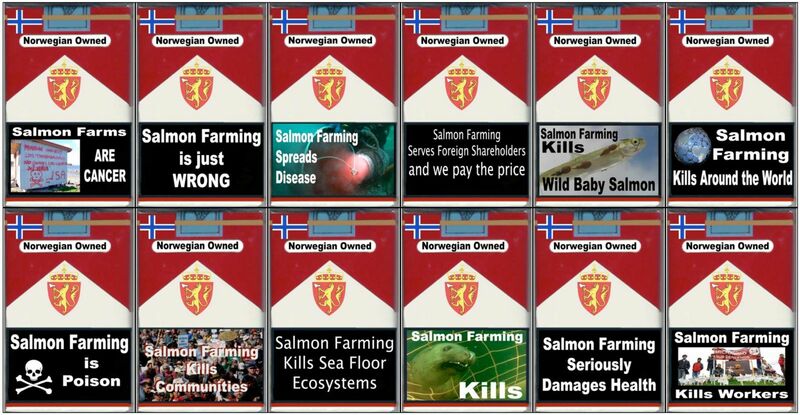 ‘Salmon Farming Kills’ employs similar graphic imagery to the ‘Smoking Kills’ campaigns against Big Tobacco and warns of the dangers of salmon farming. Next month (February), GAAIA will issue a new report on salmon - ‘Smoke on the Water, Cancer on the Coast’ - followed by reports on shrimp, tuna and GE fish. “If the fish farmers want to play the same game as the cigarette manufacturers did for many years and live in denial they’re welcome to it but it’s not going to give rise to any solutions,” said Canadian biologist Otto Langer (quoted in the documentary film Farmed Salmon Exposed: The Global Reach of the Norwegian salmon farming industrywhich was screened in Paris during last year’s Seafood Summit and at film festivals around the world). “I would never feed a child farmed salmon,” said Canadian scientist David Suzuki (as quoted in The Toronto Star). “It’s poison!" GAAIA is an international network dedicated to advancing environmentally and socially responsible aquaculture. GAAIA recognizes that salmon, shrimp, tuna and 'Frankenfish' farming jeopardizes sustainable and safe seafood production. Don Staniford, global coordinator for GAAIA is attending the Seafood Summit - ‘Responsibility Without Borders?’ – in Vancouver (31 January – 2 February).